So we stopped resisting the temptation and made omelettes. The only way to make omelettes is one at a time. Make sure your asparagus and mushrooms are sliced and your ham is cubed. Sauté the the mushrooms in a little olive oil, then you set them aside. Crack open your eggs into a bowl, and mix with a fork as if you were making a scramble. Put a little olive oil into the pan and heat it. Once the olive oil is hot pour in the eggs. Then carefully place all of your omelette ingredients on top of the eggs. When the eggs are done, slowly fold the omelette in thirds over itself. And then you are done. Carefully take the omelette out and plate it. And once you eat this omelette, you'll always be young. I had to laugh when I saw this post. 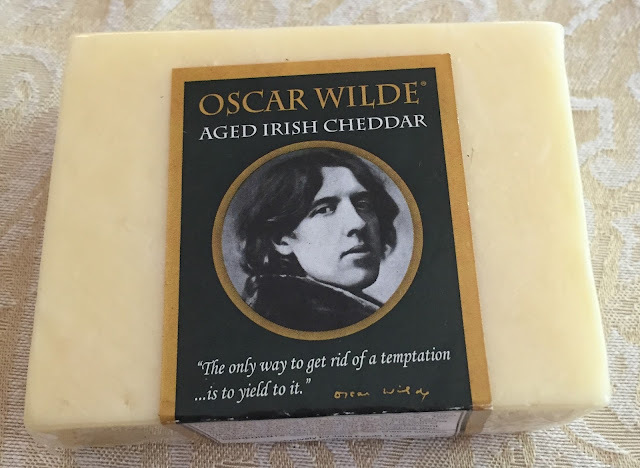 I bought this same cheese strictly because of the picture of Wilde. Fortunately, it's good cheese. Your omelet looks yummy. I'll try that next. Crazy, right? Who knew Oscar Wilde was a marketing ploy. It is really good cheese.